Gerber Sharpener » Protective Solutions, Inc.
Gerber blades are legendary for keeping an extremely sharp edge, but out in the field every knife needs maintenance. The Gerber Downrange Knife Sharpener has a carbide sharpener for a fine-edge blade, two different diamond-coated rods for serrated blades and a flat diamond-coated plate for finishing. 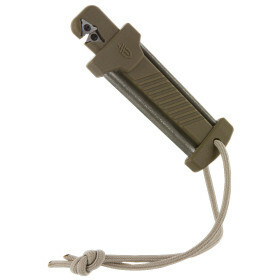 Its compact machined aluminum body is covered in TAN499 ceramic and includes a 550 lanyard.